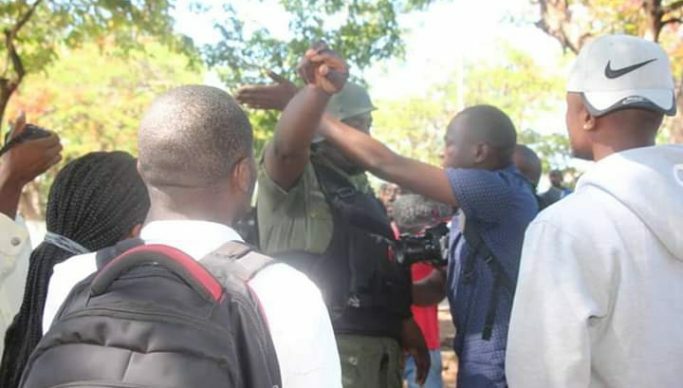 Police in Ndola have arrested Zambia National Information Service Ndola Journalist Frank Ching’ambu for filming outside Ndola police station as he and other journalists were waiting the arrival of UPND President Hakainde Hichilema for interrogation. He is currently being held at the facility whilst other journalists have also been denied access to the premises. UPND president Hakainde Hichilema arrived at the Copperbelt Divisional Headquarters at exactly 09:26 hours for interrogations amidst tight armed security around the premises. Hichilema is accompanied by his vice Geoffrey Bwalya Mwamba, National Democratic Congress leader Chishimba Kambwili and People’s Alliance for Change president Andyford Banda. Others are UPND Copperbelt chairman Elisha Matambo and senior party officials. Meanwhile, some lawyers representing Hichilema were blocked by the police as only Jack Mwimbu and Mulilo Kabesha were allowed access. And Hichilema demanded that the other two lawyers, Keith Mweemba and Gilbert Phiri be allowed before proceeding with the interrogations. Most roads in Ndola have been cordoned off by the police in the Central business district, restricting access to the High Court, magistrates’ court and Ndola City Council among other places. Meanwhile, journalists on the Copperbelt have created a hash tag, #ReleaseFrankChing’ambunow to press for the release of Ching’ambu who still remain in police custody.